Dating sim romance options are no longer stuck in the realm of high school girls and 20-something office professionals. 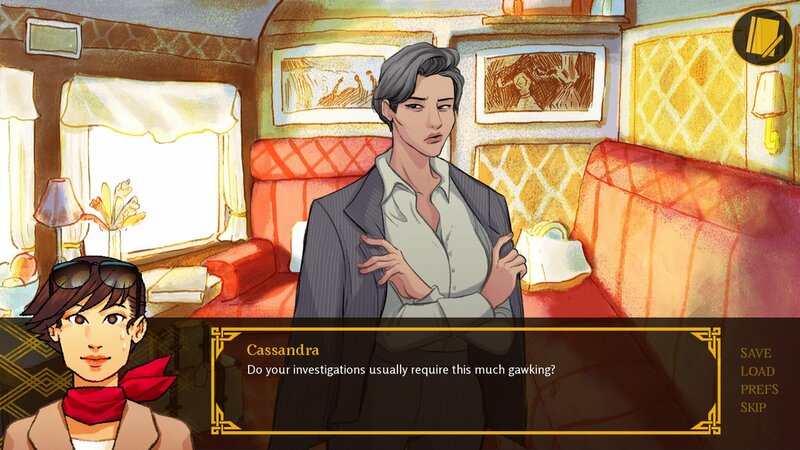 Games like Hatoful Boyfriend and Dream Daddy have pushed the boundaries into the surreal and the middle-aged and Love on the Peacock Express is here to continue in that tradition. Originally designed as a part of Yuri Jam 2017, Love on the Peacock Express is a heartfelt exploration of May/December romances by a talented team that was kind enough to talk to us about their development process. Why don’t you start by introducing yourselves. Hi! We're the lead team on Love on the Peacock Express. J: I'm J (they/them), and I was the producer and lead programmer on this project. I'm a technical artist currently on contract at Insomniac Games, and twice a year I co-host My First Game Jam on itch.io. Queenie: I’m Queenie (she/her), and I was the art lead slash art director. I am currently a freelance illustrator. I've freelanced for the indie game Battle Chef Brigade and I've also worked on comics for BOOM! Studios. Hana: I’m Hana (she/her), and I was the design lead. I currently work in the tabletop game industry, and I have some experience making short narrative-based computer games as a hobby. Ivory: I'm Ivory (they/them) and I was the writing lead. I work in a professional writing capacity on the romantic VN app Lovestruck, with a focus on LGBTQ stories. What’s the deal with Love on the Peacock Express? Why were you interested in making a game about dating older women? Older women are left out of most romantic media, especially in the mainstream. They are underrepresented in general. Yet there's long been an undercurrent in WLW (women who love women) spaces that finds these sort of women appealing. Things like wrinkles and gray hairs don't match up with mainstream beauty standards for women, but we’d argue that they give our characters more character and make them more attractive. There's a sense of experience and stability that draws people in. Success can be as much of an allure as beauty, and providing a diverse spectrum of what's attractive is a good thing for romance -- or any kind of media, really. Iris is an older trans woman, Vic is a butch from a generation when that wasn't an easy thing to be, and Cassandra's power and influence is usually portrayed as something that separates women from romance entirely. Yet we managed to have all three! You’ve got a pretty large team listed on your itch.io page. How did such a large crew come together? When Dream Daddy's release was announced, quite a few people were like: Hey, when do we get a mom version? The response to a casual tweet poll was pretty incredible—it turns out that a lot of people wanted to work on a game like this. To make the process more formal, an application was created and blasted out over social media. J picked leads for art, writing, and design. This core team brainstormed game ideas and love interests, keeping in mind that the game would need to be completed in the two months of Yuri Game Jam. When we locked in the game's design and scope, we had a better idea of the amount of work and target team size. The leads picked applicants from a second round of applications, looking over writing tests, art portfolios, music samples, and previous game dev experience. Visual novels are typically content heavy, and require a lot of art assets and writing. We were fortunate to have a decent number of artists interested in joining, and we reached out to quite a few so that we could split up the work over the two month timeline. Our goal was to ensure that no one was crunching and also create a safety net in case someone couldn't finish something. While the number still might seem very large for a game team, this is a much more manageable team than ten programmers and three artists + writers. The amount of coordination needed between multiple artists isn't as demanding as multiple programmers. You’ve seen a good amount of success so far, are there any plans to get the gang back together and expand Love on the Peacock Express? The first few days after the release were pretty overwhelming! We're grateful for all the support and generosity of players who have donated to good causes. Our goal was to release a short, self-contained game for Yuri Game Jam to prevent development from dragging out. Unfortunately, we do not have plans to expand the game further, but we are planning to release a development PDF soon to share our design and production process. What was it like developing the game during the Yuri Jam? Was there anything you had to cut due to the time constraints? We were very careful to scope the project for the two month jam. Aside from a mildly crunchy last weekend with a few late coding nights and last minute CGs, most assets were done pretty comfortably over the two months. The project had a strict timeline with clear priorities, and we managed to hit all of the planned assets and features, including low priority tasks like particles. Most unused elements were cut in the planning stages, and certain design elements ended up streamlined: We had initially planned for an inventory and journal, but quickly realized it didn't make sense for the length of the game. Is there anything you’d like to say to the people who are on the fence about trying out LotPE? Love on the Peacock Express was created with a very specific audience in mind, and it's likely a game you're very into or not. 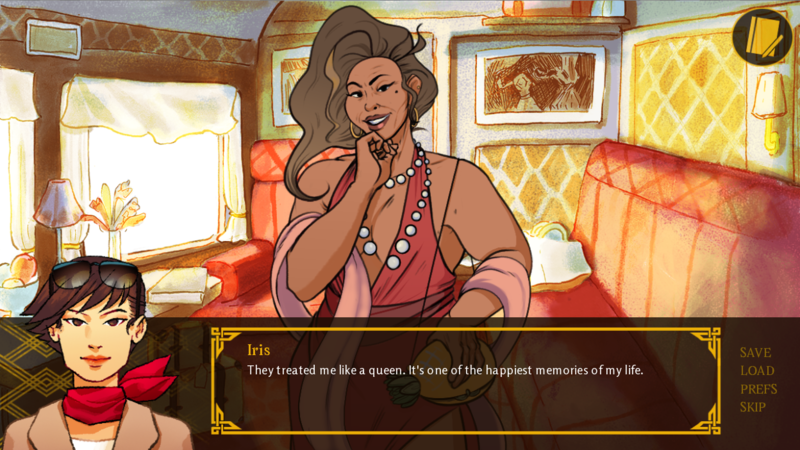 If you've been waiting for a gay dating sim with older women (or Dream Daddy but with hot older moms), this is for you! If you haven't, we appreciate you sharing it with your queer friends.